The Supreme Court’s Obamacare decision has moved another conservative into my corner on Medicaid. As I argued in my most recent TRB column (“States of Confusion”) Chief Justice John Roberts’s opinion inadvertently pushed the state-federal Medicaid program toward outright federalization by weakening federal control over the program. The federal government already provides a majority of Medicaid’s funding, and under the Obamacare expansion the feds will initially provide 100 percent of the funding for the newly-eligible before ratcheting that down to 90 percent. Yet this expansion, nonsensically, was deemed by the Court unduly coercive and burdensome. 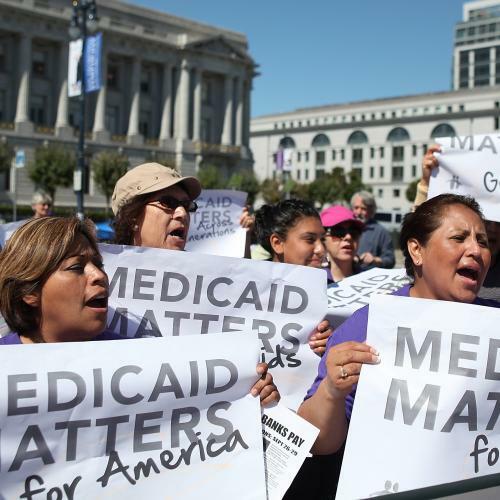 Consequently, it ruled that states could choose to participate or not participate in the expansion without endangering their eligibility for existing Medicaid funds. Many are now threatening not to participate, in spite of the light-as-a-feather financial burden the expansion would impose on them. In my column I argued that the federal government’s loss of leverage over state spending calls seriously into question why the feds should bother maintaining the program’s 47-year partnership with the states. Better to have the federal government assume full responsibility for Medicaid. The New Federalism be damned. If states can no longer be counted on to provide health insurance to their poorest citizens, then it’s time to take this responsibility away from them. It’s doubtful they want it. Robert J. Samuelson comes at this problem a bit differently, but he ends up where I do—consciously, in this instance, in favor of federalizing Medicaid. Samuelson emphasizes Medicaid’s burdensome cost to the states (true) and the federal government’s superior ability to control medical inflation (also true). He puts too much credence in the states’ complaint that they’ll one day end up having to pay for more than 10 percent of the Obamacare expansion; I say lets cross that bridge if we get there. But basically he agrees with me; it no longer makes sense for Medicaid to be anything other than a federal program. Samuelson would lighten the financial burden on the feds by making Medicaid federalization part of a swap (one initially conceived three decades ago by then-Gov. and now-Sen. Lamar Alexander, R.-Tenn.). The states can stop funding Medicaid, which costs them about $200 billion a year, and in exchange they will stop receiving federal aid for K-12 schools and roads, which totals about $200 billion a year. Alexander recently observed that, had his version of this deal (which excluded transportation funds) been struck in 1981, the states would today be $92 billion richer. The problem with this plan, as Samuelson readily admits, is that members of Congress would be very reluctant to give up control of the purse strings for local spending that might help them win votes. Better, I think, for the feds to take over Medicaid and then quietly ratchet down grants to the states here and there, bit by bit. That way you’re less likely to mobilize opposition. Doing it this way also would give Congress greater freedom to figure out which particular grants (they wouldn’t have to be just those for education and transportation) seemed the least necessary. Incidentally, Samuelson writes that a Medicaid swap was proposed in 1982 by Ronald Reagan, and that it was rejected “because it threatened the power of congressional committees and interest groups.” That’s slightly misleading. The swap Reagan proposed was federal takeover of Medicaid in exchange for the states taking over Aid To Families With Dependent Children, then the federal government’s principal welfare program, and the federal food stamps program. This was understood to be a back-door attempt to shut down AFDC and food stamps, since the states were unlikely to maintain these programs at anything like the previous level. It was a transparently crummy deal for the poor, and that was the main reason it was rejected (though it’s also true that the food stamp program enjoyed broad support from farm state senators—even Republican ones like Sen. Bob Dole, R.-Kan.—on the grounds that it helped boost agricultural demand). AFDC ended up getting shut down anyway by President Bill Clinton under the 1996 welfare reform bill, but at least there was a (much stingier) replacement program, Temporary Assistance For Needy Families, to replace it. If the states had taken over AFDC in 1982, then welfare recipients today would likely be even worse off than they are under TANF, with little or no cash benefits and little or no food benefits. The point is that AFDC and food stamps were not remotely equivalent to highway funds and school grants; they served (and TANF and food stamps continue to serve) a much more vulnerable population. But no reason to dwell on disagreement. “Sam” is an old friend and onetime Newsweek colleague whom I’ve long liked and admired, and in recent years I’ve noticed with some regret that we no longer seem to agree about very much. (He’s drifted right, I’ve drifted left.) Nationalizing Medicaid is a cause we can both get behind, along with Sen. Alexander, who’s still game.